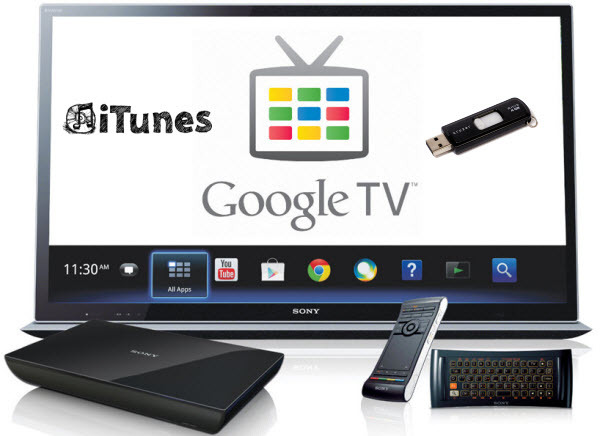 Can I play iTunes Videos on Google TV Using Thumb Drives? Google TV has been all over the news recently, because of recent press events by Logitech and Sony, with the search engine giant making its big play for the living room space. Other TV Choice is here. You can copy numbers of videos that have been downloaded to Google TV and freely play them on TV or big screen display with thumb drive plugged in. However, it doesn’t seem to work when you need to enjoy iTunes M4V movies with Google TV. Though you are able to change the movie format from itunes to quicktime on the thumb drive, your tv can’t correctly recognize or play it. The Quicktime container format is close enough to MP4 that you can rename the .qt extension to .mov or .mp4 which are compatible with Google TV. As long as the encapsulated video and audio streams inside are using are compatible with the H264/AVC video and AAC audio codecs then you should be able to play them. If they’re not; however, then you can use some third-party software to remove DRM and convert them to the MP4/H264/AAC format necessary to be played on your Google TV device. To complete this goal, you need an all-in-one DRM removal and video converter. Here, Pavtube iTunes DRM Converter is highly recommended for its easy-to-use interface, straight workflow and reliable video quality. Read the review. It can remove the DRM protection from iTunes downloaded video, and transfer it to various video formats including MP4 profiles for Google TV. Mac version is here. Now, You are suggested to use USB Flash Drive, SD Card to help you transfer the video files from your PC to Google TV. Please download the program on your Windows PC or Mac first for preparation. Drag and drop your iTunes videos to it directly, or you can click icon to import them as below. Let’s click the drop-down-list besides “Format” and choose “Common Video> H.264 Video(*.mp4)” as output format for your Google TV. Click “Settings” to enter Profile Settings window, you can find settings for video size, codec, bitrate and frame rate. To get 1080p quality for video playback, you are suggested to set the Size to 1920*1080. Now click the big red icon to start converting iTunes M4V video to Google TV in batch; this converter will activate your media player automatically and start to play this video. The player windows cannot be removed or closed. Then you just need to wait till the conversion completed. After the conversion, click “Open output folder” to quick locate the converted video. Step 4: Copy converted videos to your thumb drive. Locate the movie on your computer, and right-click it. Select “Copy,” or “Cut” if you want to move it without keeping a copy on your computer. Go to “My Computer,” and click on the flash drive. Select a folder on the flash drive to which you want to transfer the movie. Right-click the screen, and click on “Paste” to transfer the movie to the flash drive. Wait for the movie to finish transferring; movies may take a while to transfer due to their large size. And now you are free to enjoy iTunes Videos on Google TV Using Thumb Drives.